The Bull Flags screen is our second most popular screen at the time of writing. Some basic information on flags can be found here and some details on our most recent additions to flag screening can be found here. 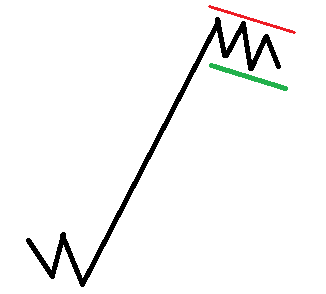 A bull flag is a technical continuation pattern which can be observed in stocks with strong uptrends. The pattern takes shape when the stock retraces by going sideways (or by slowly declining) after an initial big rise in price. When you see the graphical representation of this pattern, you’ll notice that it somehow looks like a flag on a pole. RUN UP - In the first stage, buyers aggressively step in the market, driving prices higher. These buyers then attract other buyers, creating a real buying frenzy (also called momentum). CONSOLIDATION - After a while price settles down. This happens because less and less buyers are willing to purchase shares at this point (potential buyers begin to view the stock as too extended). Sellers also begin to come into the market because they don’t want to give up the made gains. When all of this happens, the stock will go into consolidation. It will remain in this phase until (new) buyers or sellers enter the market and disrupt once again this equilibrium. How to spot decent bull flags? The run-up before the flag was a clear, fast and huge move with big volume. 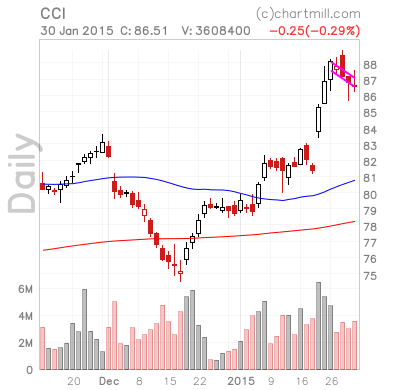 By a clear move we mean a price run- up that mainly closes near its high each day. We want to spot clear conviction among the buyers. So don’t select stocks that are jumping around and are meeting resistance every five seconds! The quality of the pattern is very important because it can reveal us how most market participants are thinking and feeling so you can act correspondingly. Please do keep in mind that on a trade-by-trade basis we are never sure if this/that particular trade is going to make us money. Money in the trading business is always made on the long run, by repeating and exploiting the same market anomalies (like momentum bursts) over and over again. We are thus never sure who’s going to step in the market to support our initial trading hypothesis. 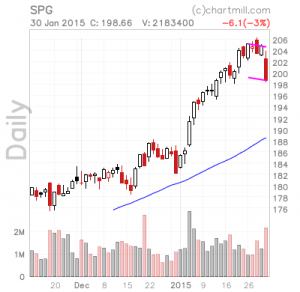 Although SPG still qualifies as a bull flag, we would reject the pattern shown here based on the high volume 3% sell-off observed in the last candle. Perhaps a longer term base formation is still possible, a short term continuation of momentum is less likely. CCI does show a nice bull flag pattern. 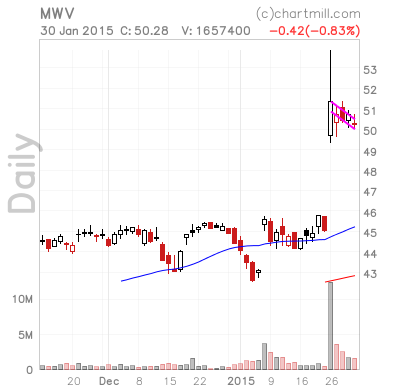 We see a heavy volume breakout and a flag formation under lower volume. Interesting to see is that a drop down was rejected on the last but one day, while a breakout was rejected on the last day. But both days closed in a very tight range. 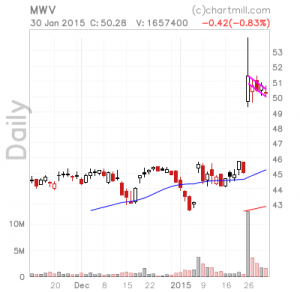 We also see a potentially interesting pattern in MWV. Something must have happened a couple of days ago and investors are not sure yet what the new price should be. Should it be 54 or 49? After the big gap up, prices have been in a tight range for a couple of days now. A new breakout above roughly 51 could be a start of a new momentum run-up.